If you love a good root beer float, you might want to try a spiced apple cider float! I posted this last Christmas season but thought I would share it again since its the best time to buy apple cider!! Oh, and I am pretty sure if you wanted to make an “adult” float, eliminate the pumpkin pie spice and use cinnamon whiskey instead. Enjoy! I bought some root beer and a pork roast to make pulled pork sandwiches along with a root beer barbeque sauce; the root beer had me dreaming of a root beer float. But I was sipping a cup of hot spiced cider, so my thoughts went down a different path, I don’t know about you but my mind is like a computer with about 100 tabs open…. Anyway, I made an apple cider float instead. And boy oh boy was that yummy! It’s not all that difficult to make, the amount of ice cream and cider you use depends mostly on the size of mug you use, you really don’t need a recipe but here is what I did. Of course I pulled out the BIGGEST mug I had and filled it with vanilla ice cream. I’m sort of ashamed but yet a little proud that I used about 1-1/2 cups of ice cream…well, it was actually frozen yogurt but anyway… I heated 3/4 cup of apple cider with a dash of pumpkin pie spice, it’s not just for pumpkin pie…its combination of all the spices I love so why not!! Heating the cider is not necessary but I love that it melted the ice cream and made it so much more creamier and the heat also helps to blend the spice into the cider instead of it just floating on top. Then I poured the hot spiced cider over the ice cream, put on a big dollop of whipped cream and drizzled it with caramel sauce, instant heaven! I curled myself up with a blankie on the sofa and watched a Christmas movie while enjoying my new treat! Once upon a time, our local Pizza Hut had a little lounge in the back called the Grog Shop, more of a bar. And in that bar they served taco pizza. I would occasionally take my kids there, with much glare from other customers, and we would devour a large taco pizza. 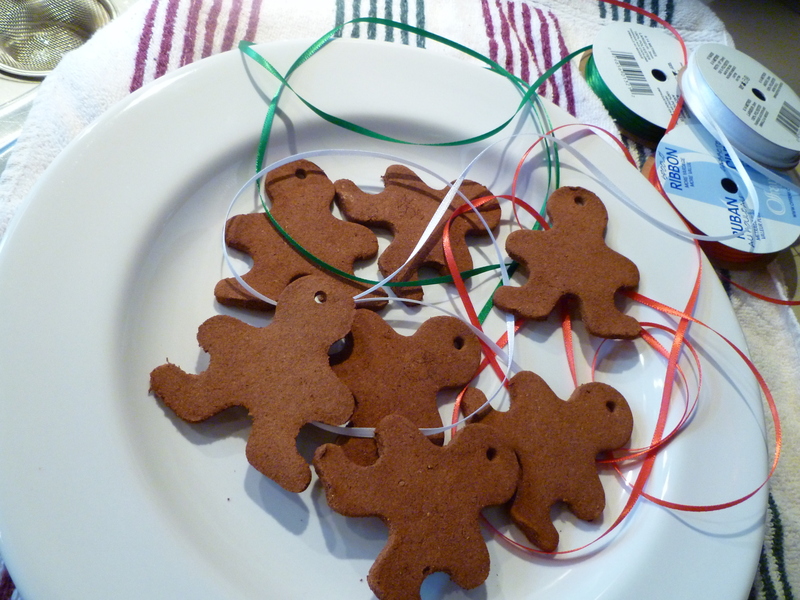 That was a treat to take them BUT it was a better treat that I made them at home too!! I would buy one of those already prepared pizza crusts *insert a shudder, and build my taco pizza with refried beans, lettuce, tomato, cheese and salsa. The kids LOVED it! I often wonder if they remember that?? 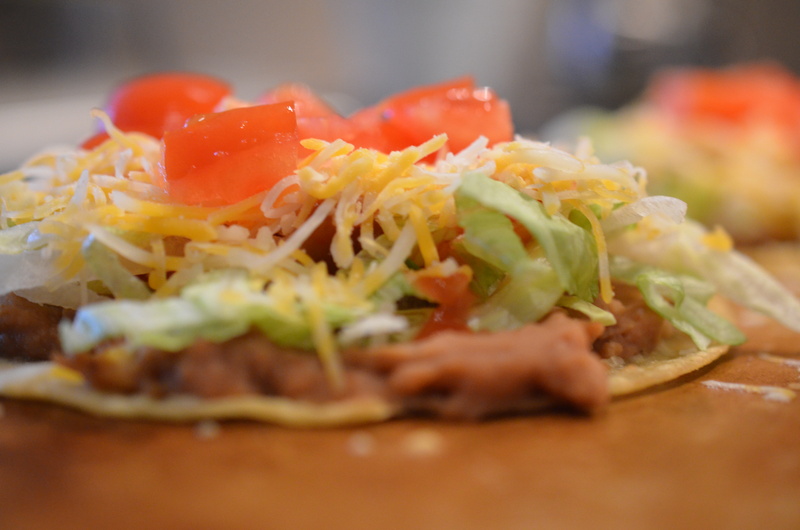 I like to use a Gluten Free corn tortilla, but I have also used flour tortillas/soft taco shells and they work great. I like to fry them up a little, just enough to get a little crispy. I have this weird thing about wraps, quesadillas, etc. I TOTALLY dislike the uncooked floury taste and texture so I have to crisp them up. You can omit this step if you’re not crazy weird like me. For the flour tortillas I would just use a small amount of olive oil in a fry pan over a medium heat and lightly crisp each side. With the corn tortillas I prefer using a little more oil, almost enough to simmer the shell, and again lightly crisp each side. It only takes a few minutes and I flip it around on both sides a few times. 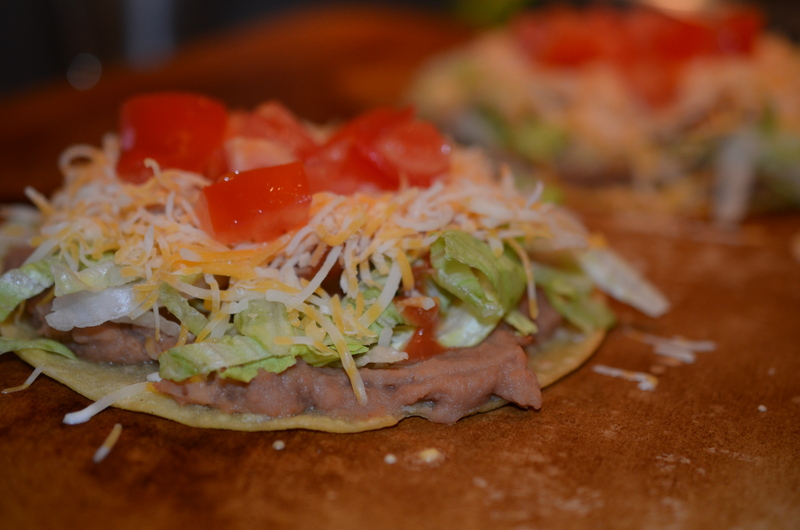 I then put them on a pizza stone and smother them with refried beans. I have dressed the beans up, depending on my mood, with different ingredients. I’ve chopped jalapeno’s, added some taco seasoning (I now use my own concoction), cayenne pepper, whatever spice I feel like at the time. Pop the pizza stone with the smothered shells in a preheated 375 degree oven for about 10-15 minutes or until the beans are hot to the touch. The shells will crisp up a little more too. You could also put them directly on your oven rack, I’ve never done that tho. I am a creature of habit!! When they come out of the oven, here is where you can be creative and build your own “personally designed taco pizza“. You could add cooked and prepared taco meat if you want but I never use the taco meat mixture with the beans. It’s just how my taco pizza rolls. No meat. Just beans. 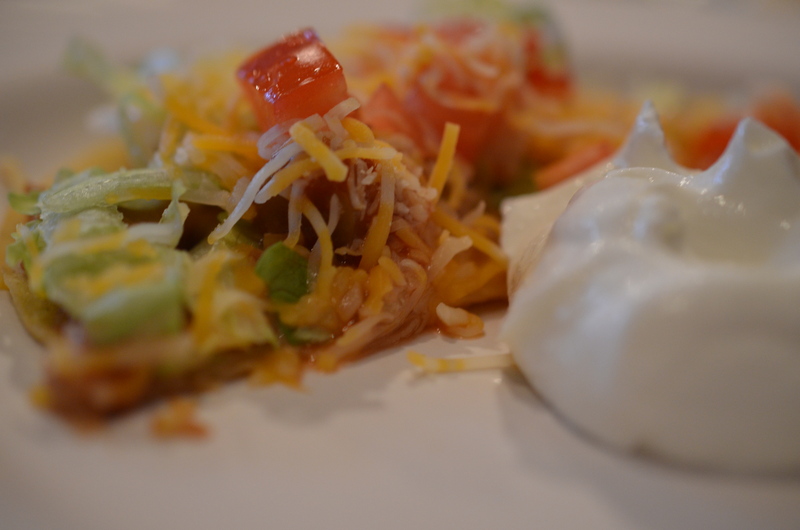 Top with shredded lettuce, drizzle with your favorite salsa, then comes the cheese and chopped tomatoes. Top with sour cream and/or guacamole. I have already put them back in the oven to melt the cheese a little more, that is quite good as well but I am usually too hungry for these and I just CAN’T wait to devour them!! These are perfect for the single person. 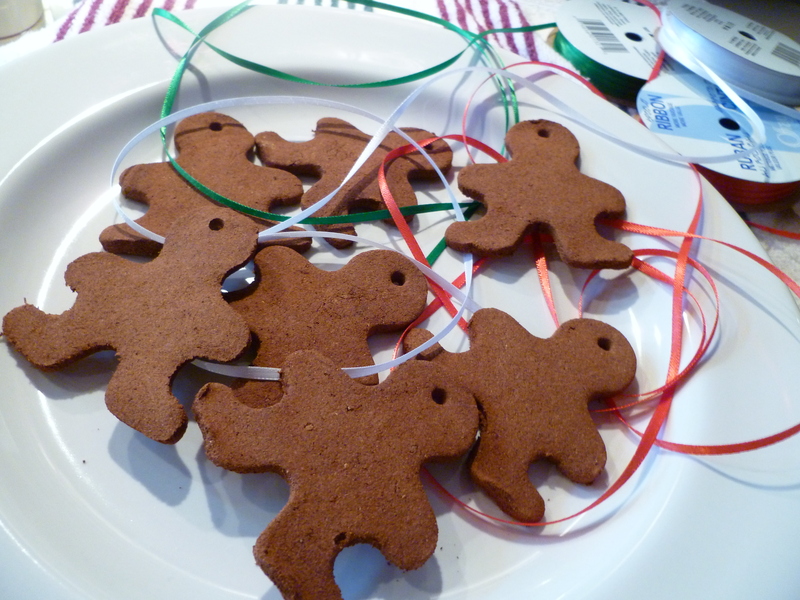 They are perfect for having your friends over for lunch or a movie. And perfect for your family too! My very talented daughter made this awesome cake for her son’s birthday party. Just a simple 3 tier layer cake but it was adorned with Angry Birds! What is it about those angry, unhappy birds that makes them so popular? I was so impressed by those angry little creatures that I forgot to take a picture of the “entire” cake in one picture, sorry. She used fondant for the bird heads. She rolled it into balls for the heads. She then cut out the shapes for the other facial features. She found a package of eyes. That sentence just sounds strange. My granddaughter wants a La La Loopsy cake, can’t wait to see how that will be created. I love ice cream! This is a healthy way to get my ice cream! And if you love a good chai tea latte like I do, you will have to try this. 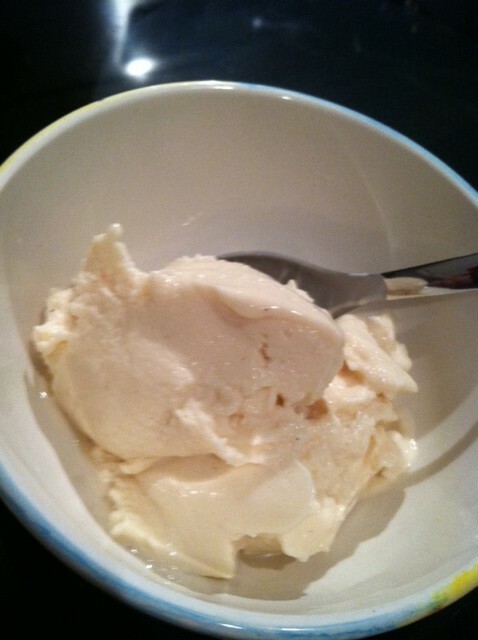 I have to admit, while it was churning away, I did stick a spoon into the creaminess and try it….more than once. 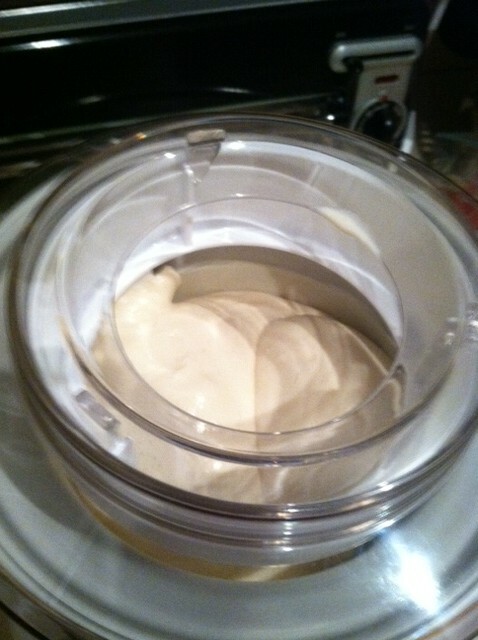 Mix it all together and then follow your ice cream maker instructions.